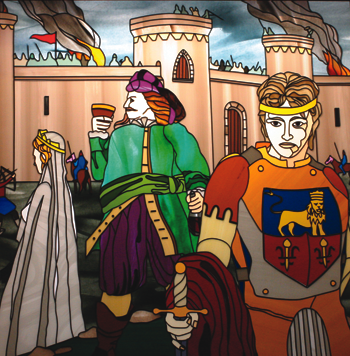 In December, 2005, Westminster School unveiled twelve, 4’ x 4’ stained-glass windows dedicated to the plays of William Shakespeare. 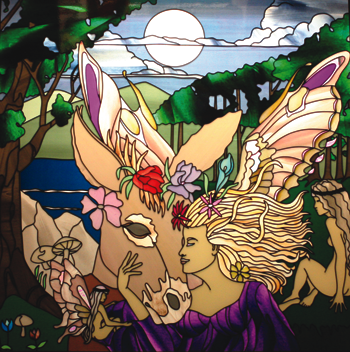 The windows were designed by and created under the direction of Tourne Shipman at SGO Design Center of Northern Virginia, using the stained-glass overlay method. 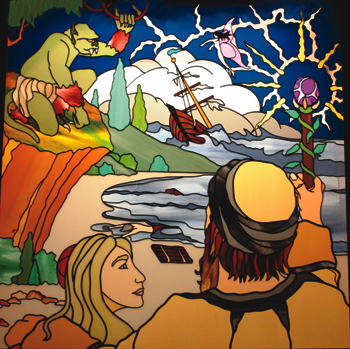 These unique art works are showcased in a superbly crafted, wrap-around wooden cabinet which is mounted in the school’s main, skylight corridor. The cabinet was designed and hand-made by Tourne’s brother, Peter Shipman, master carpenter and furniture foreman for the United States Congress. 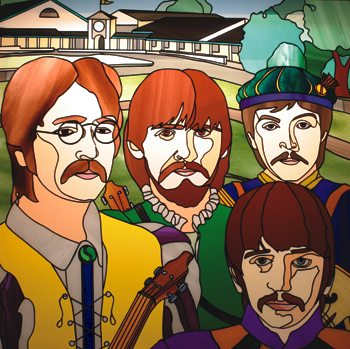 This artistic collaboration between brothers took place under the direction of Ellis Glover, the Headmaster of Westminster School. The results are a truly magnificent cultural creation. How did this unusual project take life? The answer to that lies in the curriculum and traditions of Westminster School. As part of the History / Classical Studies Program, in which students spend a year studying each of the great epochs of Western civilization, 7th graders focus on the Renaissance. In English class, their curriculum includes the great Renaissance authors, with a special emphasis on William Shakespeare. At this point, academics merge with the school’s Drama Program. 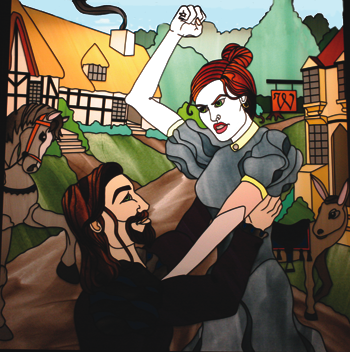 At Westminster, every student is in a play every year, and when students reach the 7th grade, they traditionally perform a Shakespeare play under the direction of Mr. Glover, the school’s Headmaster and developer of the Drama Program. Mr. Glover continues working with the students in the 8th grade when he directs them in a Broadway-level musical. It is traditional at Westminster for each 8th grade class to raise money to give a special gift to the school when the class graduates. 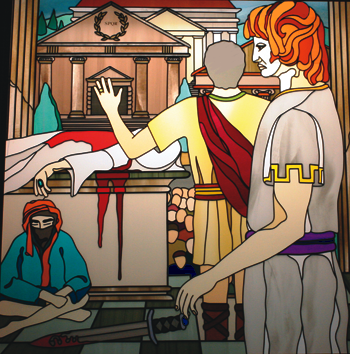 For several years, this gift was a stained-glass window depicting the Shakespeare play the class performed as 7th graders. 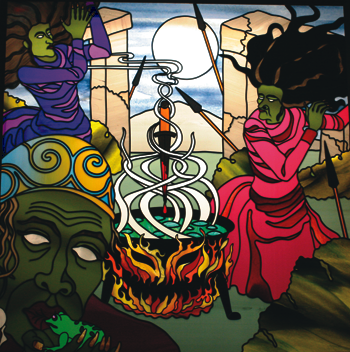 Mr. Shipman was engaged to create the first window in 1995. 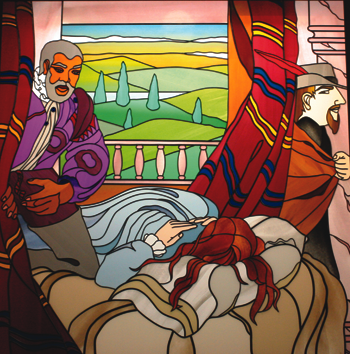 Over the years, he worked closely with Mr. Glover to design windows representing the plays as well as themes related to Shakespeare. 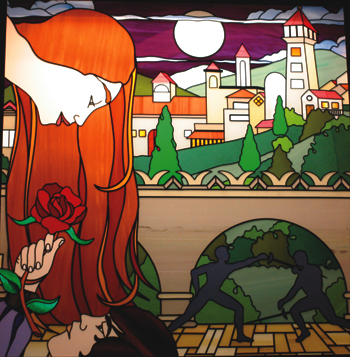 The school’s Drama Department has also commissioned windows for the collection. 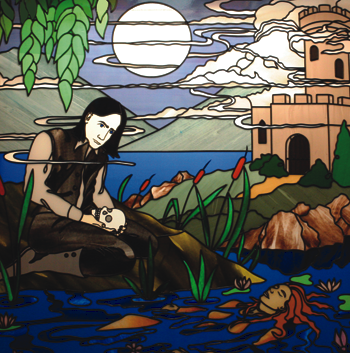 The 12 brilliant, stained-glass Shakespeare windows are now an outstanding feature of the Westminster School decor. 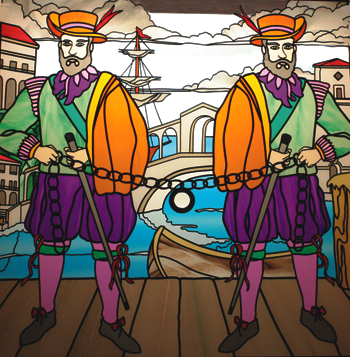 Those who would like to view the Shakespeare windows in person are invited to contact the school to arrange a visit. Westminster’s outstanding Drama Program has been developed over many years under the direction of Ellis Glover, the school’s Headmaster. What began as a way for him to be directly involved with the students soon grew to be a vibrant and unique aspect of the Westminster program. In addition to providing an annual season of lively entertainments which drew the school community together in positive ways, its effect on the students themselves soon became an impressive validation of the program. As all students are required to be in their class play each year, even the shiest children gain poise, confidence, and courage to share their talents. Over the years, Mr. Glover has directed more than 75 student plays, acclaimed for their production values and the extraordinary performances he draws from the young actors. Since becoming Headmaster, he has limited his play direction to the 7th and 8th grades, but he continues to closely oversee the Drama Program in grades K-6. The 7th grade play is a rite of passage at Westminster School. The students learn to appreciate Shakespeare’s genius and to embrace the level of commitment and effort it takes to achieve something of true excellence. They bond with their classmates in new ways as they begin to value one another’s strengths and celebrate their breakthroughs in this demanding common endeavor, which also includes important back-stage responsibilities. Finally, they discover the joy and expanded sense of possibility that comes from achieving more than they knew themselves capable of. In 8th grade, the students return to the Drama Program for “the final polishing.” This last production is at the core of the Westminster experience. The real goal of the 8th grade play is to bring out in each individual student the best that he or she has to offer, the shining essence that has been urged and trained and nurtured and demanded by nine years of Westminster’s rich provisions and high expectations. In preparing them for their last Westminster play, Mr. Glover guides the students toward extraordinary effort, excellence of presentation, generosity of spirit, and awareness of their own life potential.